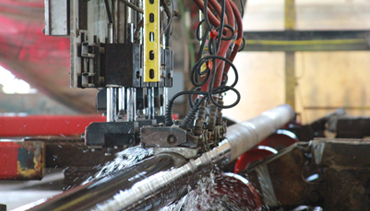 Phased array ultrasonic inspection is Patterson Tubular’s industry-leading service. We partnered with Olympus NDT to develop our phased array inspection technology, which included patenting four processes, and first introduced the technology at our Channelview, TX, facility in 2006. Since then, our phased array UT units have proven to be the most advanced in the world, consistently outperforming industry competition with a documented repeatability of ±2 dB. At its core, a phased array UT consists of several probes, each with a collection of individual elements that have their own connectors and time delay circuits, i.e., an “array.” The elements can be grouped in varying configurations and pulsed with pre-calculated time delays to form software configurable wave fronts, i.e., “phasing.” The elements “pulse” in the form of emitting and receiving ultrasonic sound waves that interface with the tubular via flowing water. Our phased array UT units are capable of inspecting in the longitudinal, transverse, and oblique orientations, as well as identifying lamination discontinuities, measuring OD ovality, and measuring and mapping wall thickness. All phased array inspections produce auditable digital records and are archived per customer requirements. In general, our phased array units are compatible with tubulars comprising the following characteristics. Please contact us for more information regarding tubular goods outside this range.